The South African Versatile Hunting Dog Association (SAVHDA) is a non-profit organization that utilizes performance based testing systems to evaluate the hunting qualities of the Versatile - HPR Breeds, such as the German Shorthaired Pointer (GSP or Kurzhaar), German Wirehaired Pointer (GWP or Drahthaar), the Vizsla, Weimaraner, Spinone and others. The Versatile breeds, also known as the Hunt, Point and Retrieve (HPR) breeds, were developed on the European continent to satisfy the needs of the hunter who wanted a dog that would be truly versatile in all aspects of hunting. In developing these dogs, clubs and breeders developed certain tests that would aid in selection of traits best suited to their needs, and that would also certify dogs as fulfilling the required hunting standards. Over the years, these tests became standardized, and are in use throughout Europe, especially in Germany, and in North America. 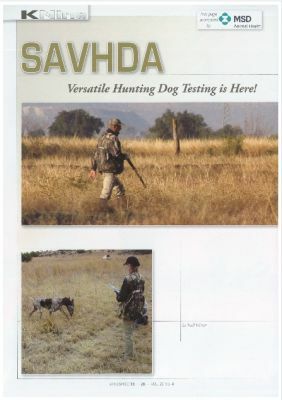 SAVHDA offers a similar system of standardized, non-competitive tests based on the European/German counterparts (ie., JGHV, VDD, DKV) and NAVHDA tests (North American Versatile Hunting Dog Association). The Field work in our Tests is run almost entirely on natural game. The Retrieving elements are conducted mainly on cold and freshly shot game. SAVHDA consists of members and affiliated Chapters. This structure allows us to best fulfil our aims and objectives. Do you want a truly versatile hunting companion that is well-trained and reliable on land and water? Then see what you and your dog can achieve together with SAVHDA. We are dedicated to the Versatile/HPR breeds! To awaken, encourage and foster an appreciation for ethical hunting and for the truly versatile capabilities of these dogs in the hunting and versatile breed community. Results of our tests will be made readily available to the public, and hence, may be used by hunters, prospective breeders, owners and potential owners as guides to proven performance and genetics. SAVHDA’s Tests are not competitions. SAVHDA’s Tests are graded to a standard and each dog is judged solely against that standard by qualified Judges. SAVHDA is not a Registry. SAVHDA is not a Breed or Breeding Association. SAVHDA does not certify dogs for breeding. The tests, their results and our database are available online on our website for people to utilize to make their own decisions. SAVHDA offers a system of non-competitive Versatile Testing and detailed results that are readily available to handlers. This provides handlers with pertinent information that will aid in training and handling their dogs. SAVHDA’s Tests are based on standardized Versatile tests in existence in Europe and the USA, and can be offered countrywide here under a similar standardized system adapted for our conditions. SAVHDA offers a variety of Tests for dogs of varying ages and levels of training. These tests range from a Natural Ability Test (suitable for a young dog) to the Utility Test (which is suitable for a mature dog trained to the highest level). Two other tests falling in between those end members are also offered: a Novice Hunting Test and an Advanced Versatile Hunting Test. The Tests are not dependent on each another, thus, a dog may be entered in a single test at any level desired or a dog may be tested through the whole system should the handler desire. SAVHDA’s Tests are divided into specific categories and specific exercises, thus providing handlers and trainers with valuable information to aid in developing better training structures and goals at each level. SAVHDA’s system of Judging is an Open system. The SAVHDA-approved Judges give immediate feedback to the test participants, and once a grade is decided upon and a test aspect finalized, the score will be announced during the Test. Once all categories are finalized, the total results are announced publicly and recorded. SAVHDA maintains a database of Test results that will be made readily available to the public on our website. SAVHDA’s website is educational, has the test results online, and has a members’ section with training, handling, judging articles as well as a discussion forum. The members section offers members additional benefits and brings the membership together as a single group on a national level. SAVHDA’s database and open recording of Test results, readily available to the public, should stimulate interest in the versatile breeds, their tests and training. A more informed approach will lead to better training and breeding decisions. SAVHDA’s database will also include other information of tests, trials, shows, etc., that are provided to us by members and verified. This is a service to members only. SAVHDA’s local Chapters are easily formed and are autonomous to a large degree. The development of Chapters will stimulate the development of training groups. The tests will also be more accessible to most areas, not only in a few areas. Local groups that train together, and test together, form lasting relationships that drive the chapters. SAVHDA also hosts an Annual Field Meet, at which members may meet, see other dogs, run in a variety of Tests, and participate in Workshops. The Annual General Meeting is held at the same time. This is an effort to bring the countrywide members and Chapters together! SAVHDA’s tests are manpower intensive. At first this may seem like a drawback and be somewhat daunting; however, we believe in the long term it will encourage people to get involved and give back to the system in various aspects of testing. SAVHDA is more than just a testing system - it is a community of people with shared interests!